Scientists develop a new method to measure the impact of pollution on global warming and reduce the gaps in knowledge on climate change. An international team of scientists led by Professor Daniel Rosenfeld from the Hebrew University of Jerusalem found a way to measure missing critical information needed to quantify manmade responsibility for climate change. In a paper published in the journal Proceedings of the National Academy of Sciences, the authors describe a new way to determine both cloud-based updraft speeds and quantify the aerosol particles’ ability to create cloud droplets. The new method used measurements from an existing meteorological satellite, operated since 2012, rather than conventional aircraft and ground stations. “This new satellite methodology enables us to quantify climate effects on a global scope, provides a more accurate assessment of the processes affecting global warming, and reduces the uncertainty there is about climate change,” said Professor Rosenfeld, an expert on climate change from the Hebrew University’s Institute of Earth Sciences. Emissions of greenhouse gases have long been recognized as a cause of global warming, as they slow the release of heat that radiates from Earth to space. “This relatively well-known warming effect is partially countered to a poorly-known extent by manmade particulate emissions, such as smoke, dust and other kinds of air pollution particles”, explains Professor Rosenfeld. Much of the climate effect of these particles, called Cloud Condensation Nuclei, comes from their impact on the behavior of clouds. Polluted clouds contain a relatively higher number of smaller droplets that make the cloud brighter. The smaller cloud droplets are slower to coalesce to raindrops, thus making the cloud live longer and reflect even more solar radiation heat back to space. Important as these small particles are to clouds and climate, they are very difficult to measure by conventional remote sensing techniques. Therefore, scientists had to rely mostly on measurements from aircraft and ground stations, which made it difficult to get a global view on the particles’ abundance and properties. Furthermore, the speed at which the air rises into the clouds is equally important in determining cloud droplet concentrations. Currently, measuring cloud base updraft is done by ground-based cloud radar or by aircraft. “Such measurements are very sparse, whereas quantifying climate effects requires conducting such measurements at a global coverage, which is possible only with satellites,” explains Professor Rosenfeld. With this technique, the researchers have opened up the possibility to provide global measurements of the two pieces of missing information that kept the uncertainty about climate change so high up to now. Estimates of global warming expected by the end of the 21st century due to manmade emissions range between 1.5 to 4.5 degrees. This uncertainty is a major cause for the intense public debate on the responsibility of mankind for climate change and the actions needed to mitigate its impacts. The international research team also includes Meinrat O. Andreae from the Max Planck Institute of Chemistry in Mainz, Germany, Zhanqing Li from the University of Maryland in the USA, Paulo Artaxo from the University of Sao Paulo, and Xing Yu from the Meteorological Institute of Shaanxi Province, Xi’an, China. The researchers developed the satellite methodology and validated it against surface measurements at sites of the U.S. Department of Energy in Oklahoma; over the ocean onboard a ship that cruised between Honolulu and Los Angeles; and over the Amazon in cooperation with the Brazilian National Institute for Amazon Research. 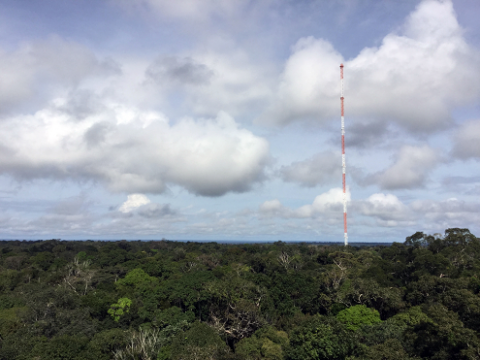 Researchers from Germany contributed measurements of Cloud Condensation Nuclei collected at the Amazon Tall Tower Observatory in the middle of the Amazon Basin. “These ground-truth data are essential for the validation of the satellite measurements. We’re hoping in the future to be able to send dedicated satellites that will collect even more accurately the data that is crucial to the understanding of effects on climate change. This will lead to more informed decisions with respect to the actions needed to counter global warming,” says Professor Rosenfeld.